It's the time of the year when those who garage their cars for the winter are getting ready for this chore or are at least thinking (and dreading) that it has to be done. While the Porsche may be in storage, our region activities will continue, although at a less brisk pace. As always we invite you to participate in the variety of events we offer. Our holiday party on Dec. 3 is our next and final event of the year. Sharon Stewart has planned a wonderful evening with a reasonable price tag. Join us. Act fast though. Your RSVP needs to be in the mail by Nov. 3. 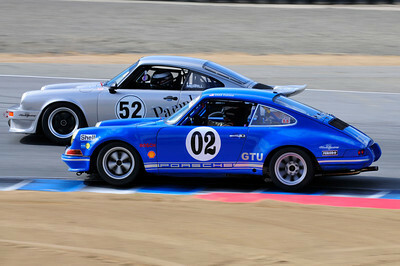 The photo at right captures the racing action at Rennsport IV in Laguna Seca in mid October. This issue contains a recap of this historic event. Dec. 1 - Board meeting. Pull up a chair, listen to the board's conversation, add your thoughts about the region and what we should offer members. Wisconsin Club Country Club at 60th and W. Good Hope Rd., 6:30 p.m. start. Meetings last about an hour. Dec. 3 - Holiday party. RSVPs are due Nov. 3. Hurry. Details here including the RSVP form. The sun was shining on Oct. 15 when 23 Porsches roamed the northern Kettle Moraine en route to breakfast in Delafield. Read the story and see photos here. Rennsport Renunion IV called together hundreds from the Porsche racing community for a fun weekend. Read the story, see some photos and watch a video here. The video, by the way, features Milwaukee Region friend and Porsche racing legend Brian Redman, among others. We also are happy to share these member profiles. Thanks to new members who respond to the request to share a little about themselves and their Porsche. Any member is welcome to submit her or his information for inclusion in our newsletter. Eric and Marcia Hagmeyer found their dream Porsche while driving their daughter to her gymnastics class. In response to the question, “is this your first Porsche,” Eric gave the most creative answer heard in a while: “Aside from the Matchbox kind, this is my first Porsche,” he said. Eric is a project engineer with a German company. He’s not sure what events he’ll participate in yet, but we hope to see him, his wife and their Porsche soon. Rick Pearson found his Guards Red Porsche in Oregon. Rick Pearson purchased his 2011 911 Carrera 4S in July. He wanted a 911 in Guards Red and “was surprised that there weren't that many out there.” He located his at a dealer in Oregon. “Of course, I ended up with a car that was a lot more ‘loaded’ with options than I would have wanted, but I am sure enjoying all of the ‘extras,” he said. Rick is most interested in track experiences at Road America and Blackhawk, but also may participate in other activities. We are looking forward to seeing you Rick with your Guards Red Porsche soon. Bleeding the brakes and clutch. Here's a step by step instruction on how to bleed the brakes and clutch. Milwaukee Region member Al Wagner reports that he recently read Walter Issacson's biography of the late Steve Jobs (founder of Apple, the successful computer company). Al reported it was “one of those books that I have difficulty putting down. Interestingly, for Porsche-types, there is a subchapter with the heading Like a Porsche.” Al shares the brief excerpt with us here. “Not a Ferrari, that’s not right either,” Jobs replied, “It should be more like a Porsche!” At the time, Jobs owned a Porsche 928. When Bill Atkinson, one of Job’s colleagues at Apple was at Job’s house one weekend, Jobs took him outside to admire the Porsche. “Great art stretches the taste, it doesn’t follow tastes,” Jobs told Atkinson. Are you the current or former owner of a 912 or 913E? If yes, you're invited to check out news from PCA regions, factory news, videos, and various information articles via Internet and a smartphone app. PCA now has a 912 & 912E Register page on Facebook. To access it first log in to your FB account, then view it at: http://www.facebook.com/pages/912-912E-Register-Porsche-Club-of-America/259276414106874. Previous owners are very welcome too; many current owners are interested to learn the early history of their car from the original owner. The classifieds are free to region members. Buy and sell (or rent) your Porsche-related items. View the current classifieds here. Welcome to Porsche Drive USA. The world of Porsche, exciting, captivating and full of intrigue. From epic motorsport victories in the world’s most famous races, to the evolution of the iconic 911. The Porsche story continues to fascinate and this is your destination to Race through the World of Porsche. Get to the heart of Porsche with Drive. Through this dynamic website watch videos, view pictures and read articles to explore what makes Porsche so unique. We believe that a good story should be shared. You will find that all of the videos, images and articles found on Drive are intended to easily be shared. The chances are if you like something on Drive you will know someone else who will as well. Simply use the number of ‘sharing buttons’ found across Drive. Porsche Drive will be continually updated with that latest content, pictures, stories and videos from the world of Porsche, so make it a regular destination. Read the story here about Porsche's investment in the Leipzig facility. ATLANTA – October 3, 2011 – Porsche Cars North America, Inc. (PCNA), importer and distributor of Porsche sports cars, Cayenne SUVs and the Panamera four-door sports sedan line-up in the United States, today announced September 2011 sales of 2,170 vehicles, an increase of 10 percent compared to the same period last year, when it sold 1,971 vehicles. To date in 2011, the company has sold 22,664 cars. In the same nine-month period last year, Porsche sales were 17,690; thus, with September results Porsche U.S. sales increased 28 percent year-to-date. For the month of September 2011, Porsche’s Approved Certified Pre-Owned vehicle sales were 714, compared to 619 last year. The year-to-date total is 6,597, compared to 5,645 in the previous year – a 15 percent increase. ATLANTA – November 1, 2011 – Porsche Cars North America, Inc. (PCNA), importer and distributor of Porsche sports cars, Cayenne SUVs and the Panamera four-door sports sedan line-up in the United States, today announced October 2011 sales of 2,270 vehicles, a decrease of 14 percent compared to the same period last year, when it sold 2,647 vehicles. To date in 2011, sales are up 23 percent compared to the same ten-month period last year. So far this year, the company has sold 24,934 cars, which compares to 20,337 vehicles last year. For the month of October 2011, Porsche’s Approved Certified Pre-Owned vehicle sales were 652, compared to 565 last year. The year-to-date total is 7,241, compared to 6,210 in the previous year – a 17 percent increase.